The Santa Claus Parade is heading through the city today & my little man is so excited! Despite the lack of snow here (and trust me, I am NOT complaining), I think the holiday season has officially started. I’ve started my Christmas shopping but I’m still looking for that one special toy to set under the tree. Since my little man’s first Christmas in 2011, there have always been Fisher-Price toys under our tree. It’s a brand I trust for its quality; in fact, my son still plays with some of my old Fisher-Price toys that are 35+ years old! You can’t beat that for quality, right?! If your little ones are anything like my little man, you know that they are always reaching for things like the remote control, the tablet, your purse & other things they probably shouldn’t be getting into. It was tough enough for me to program that TV remote control once – I don’t know if I could do it twice! Fisher-Price knows what your little ones are looking for and they’ve created educational toy versions of them like the Laugh & Learn Smart Stages Tablet, Laugh & Lean Smart Stages Toolbox, Laugh & Learn Smart Stages Scooter, Laugh & Learn Sis’ Smart Stages Purse, and so much more! Want to learn more about some of the hottest toys this holiday season & maybe even win some for the special children in your life? 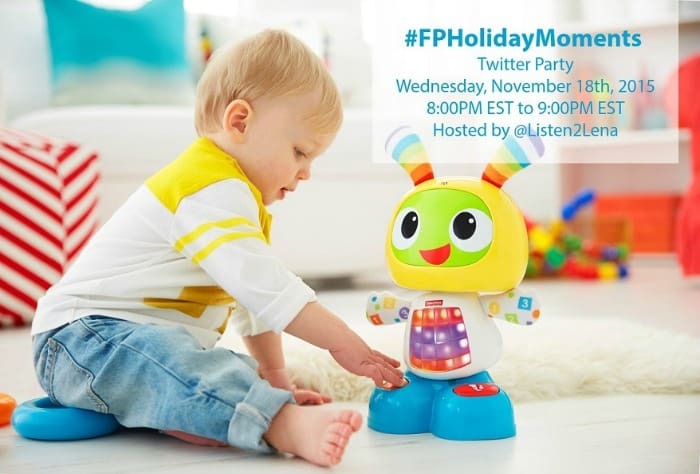 Join us for the #FPHolidayMoments Twitter Party! Mark your calendar for the #FPHolidayMoments Twitter Party happening Wednesday, November 18th from 8:00pm EST to 9:00pm EST. Our host, @Listen2Lena, will be telling us about some of the toys your little ones would love to see under the tree this year PLUS there will be approximately $900 in toy prize bundles to give away! You don’t want to miss this party! To be eligible to win, RSVP for the party below. Prizing is open to Canada only.